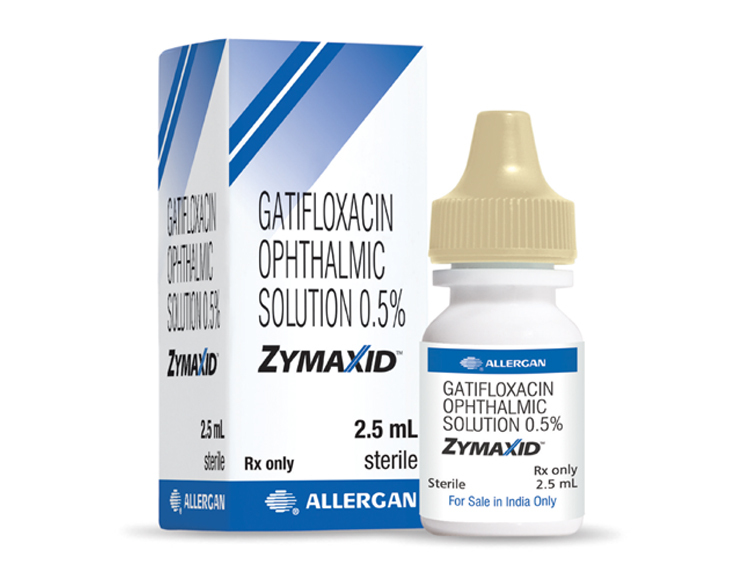 Zymaxid™ ophthalmic solution is a topical fluoroquinolone anti-infective indicated for the treatment of bacterial conjunctivitis caused by susceptible strains. Patients 1 year of age or older: Instill one drop every two hours in the affected eye(s) while awake, up to 8 times on Day 1. Instill one drop two to four times daily in the affected eye(s) while awake on Days 2 through 7. ZYMAXID™ contains Active: gatifloxacin 0.5% (5 mg/mL); Inactives: benzalkonium chloride 0.005%; edetate disodium; purified water; and sodium chloride. May contain hydrochloric acid and/or sodium hydroxide to adjust pH.